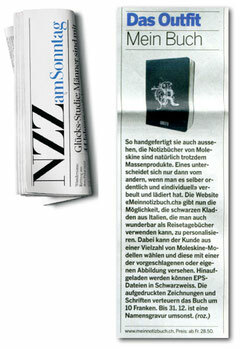 Moleskine Notizbücher sind die perfekten Reisebegleiter. Darum gehören sie auch zum Outfit eines jeden Reisenden. Und wenn Sie noch personalisiert werden können, dann steht der Erinnerung für die Ewigkeit nichts mehr im Wege. Heute in der NZZamSonntag netter Hinweis im Reisebund. Every weekend i used to pay a quick visit this web page, for the reason that i wish for enjoyment, as this this web site conations in fact pleasant funny material too. Excellent web site you have got here.. It's hard to find high-quality writing like yours nowadays. I seriously appreciate people like you! Take care!! Really when someone doesn't understand then its up to other visitors that they will assist, so here it happens. Hi to every body, it's my first go to see of this web site; this website carries awesome and actually fine data in favor of visitors. I am truly pleased to read this webpage posts which carries tons of useful facts, thanks for providing these statistics. Hey! I know this is kinda off topic but I'd figured I'd ask. Would you be interested in exchanging links or maybe guest writing a blog article or vice-versa? My site covers a lot of the same topics as yours and I think we could greatly benefit from each other. If you are interested feel free to shoot me an email. I look forward to hearing from you! Wonderful blog by the way! With havin so much written content do you ever run into any problems of plagorism or copyright infringement? My website has a lot of exclusive content I've either written myself or outsourced but it seems a lot of it is popping it up all over the internet without my agreement. Do you know any methods to help prevent content from being stolen? I'd truly appreciate it. You're so awesome! I don't suppose I've truly read through something like this before. So nice to discover somebody with a few original thoughts on this subject. Really.. thanks for starting this up. This site is something that is needed on the internet, someone with some originality! Hi, i think that i saw you visited my web site so i came to �return the favor�.I'm trying to find things to improve my web site!I suppose its ok to use some of your ideas! !